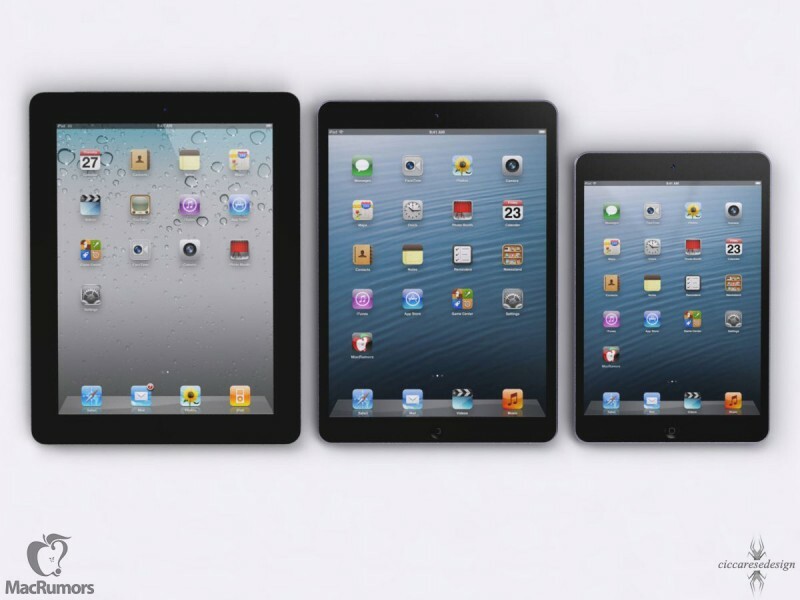 iPad 5 Estimated to Be 15% Thinner, 25% Lighter Than Current iPad - iPhone.MY - Daily News On Mac, iPhone, iPads, iPods and more! KGI Securities analyst Ming-Chi Kuo, who has on a number of occasions offered accurate information on Apple’s product plans, recently published a new research note outlining his expectations for Apple’s fifth-generation iPad. Kuo expects mass production and shipments of the new iPad to ramp up in the August-September timeframe, with the device registering roughly 15% thinner and 25% lighter than the current full-size iPad. We think the tablet will, at 7.5-8.0mm, be 15% thinner than iPad 4. The new device will likely be about 500 grams, or some 25% lighter than iPad 4, run on an A7X processor, and sport cameras with similar specs to the iPad 4’s (front HD, rear 5MP). The casing shape and color (silver and black) and narrow bezel design will be similar to the iPad mini’s. The prediction of a 7.5-8.0 mm thickness is in line with previous claims that the next iPad will see a roughly 2 mm reduction from the current 9.5 mm thickness. Kuo predicts that Apple will adopt the same GF2 touch technology used in the iPad mini, enabling Apple to design a thinner display for the new full-size iPad. In addition, more efficient display and chip technologies are expected to bring down the device’s overall power consumption, allowing for a smaller and thinner battery. We therefore think that iPad 5’s battery capacity will be 25-30% smaller, at 8,500-9,000mAh, than iPad 4’s, and the battery’s thickness will be 15-20% smaller, at 7.5-8.0mm, and the number of cells will be reduced to two from three. As for the chip powering the iPad 5, Kuo believes that Apple will be sticking with Samsung for a new A7X chip that will take advantage of Samsung’s 28-nanometer process node. There have been reports that Apple will be shifting its A-series chip production to Taiwan Semiconductor Manufacturing Company (TSMC), but it appears that Kuo believes that transition has a bit further time horizon, in line with rumors that a partnership between Apple and TSMC for 20-nanometer A7 chips will not begin production until early 2014. Just last week, Kuo issued a report claiming that Apple’s iPhone 5S, lower-cost iPhone, and second-generation iPad mini will launch later than currently expected by market watchers, with a variety of technological challenges still needing to be addressed by Apple. While Kuo did not offer specific predictions of when Apple will launch those devices, he did lay out a series of three scenarios addressing the possibility of August/September, September/October, and October/November timeframes. Infographic: How Popular Is The iPhone?